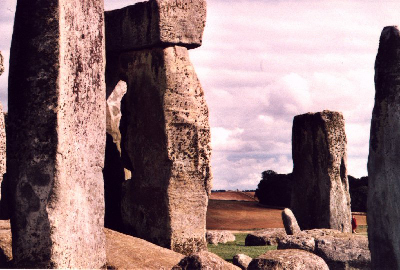 At Stonehenge there is a carving cut in deep relief which had gone unnoticed until recently. It is on the narrow, outer side of trilithon stone 54 and faces west. The carving was accomplished by abrading away up to 75 mm of the stone's vertical surface and must surely date from antiquity. It shows a forward-facing, grave, distinguished face having prominent eyebrows, a long straight nose and well-formed upper lips. Although the sculpture can be studied in close-up at any time of day, it is easily seen from afar only when highlighted by oblique sunshine, and for this 13.50 to 14.40 BST (12.50 to 13.40 GMT) is optimum. This short time interval, together with the need for sunshine, accounts for the carving going unnoticed until now. The same applied to the axe and dagger carvings on trilithon stone 53 which were discovered 46 years ago. They had gone unnoticed until the middle of the 20th century, and yet when the sunshine is right they can be seen from 30 metres away. 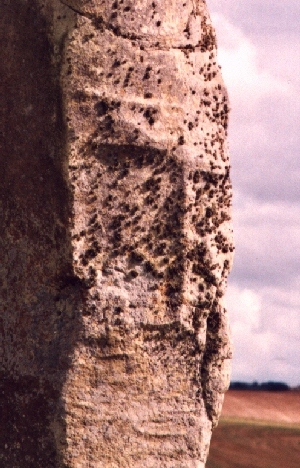 Similar carved heads have been reported for major megaliths at Avebury.